So, here's the first project I'm uploading to my blog. I submitted this layout to Stampin' Up! for a contest. I haven't heard back, so I have no idea if it's a winner. Regardless I love this layout! 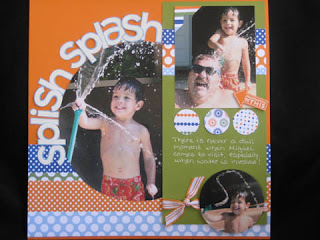 For this project I used Stampin' Up! Jersey Shore DSP, Pumpkin Pie, Bashful Blue and Old Olive cardstock, Big Deal alphabet, Whisper White Craft Ink, White embossing powder, Pumpkin Pie striped grosgrain ribbon, This way punch, 1 1/4 inch circle punch, Photo corners punch, and rubons. I loved these pictures when I took this last summer but hadn't gotten around to doing anything with them. I hope you enjoy this project. I loved using the circles in this layout, to me it repeated the pattern in the paper and really put the focus on the large picture! Sharon, Great to see you blogging! I love your page, too! Sharon, I am so glad you are blogging. Your work is so creative; now I can look at it more often. And you make a great princess! What a great layout and adorable photos of M, Sharon. And why didn't I know you were blogging?!! :D Looks great!